“King maintains his svelte, addictive style….”—Kirkus ReviewsNever cheat a partner. Always get revenge. . .The Traveling Man takes on a quick and easy safecracking job…easy until his partners are murdered and he’s on the run.His wife is trying to settle into her new role as a rich man’s girlfriend, so she isn’t at his side.Who are these killers who are after him? And how are they connected to the government agency that wants the envelope he took from the safe?With the help of a new associate, he tracks the killers until he’s steered into a trap. 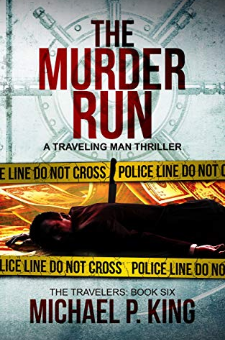 They think he’s cornered, but he’s still got one ace up his sleeve. . .The Murder Run is a gritty, hard-boiled crime thriller. If you like criminal intrigue, surprising plot twists, and high-speed action, you’ll love the sixth novel in the Travelers series.Buy now to lose yourself in the Travelers’ latest scam!The Travelers crime thrillers contain profanity, violence, and sexual situations typical of the genre and similar to R rated movies.